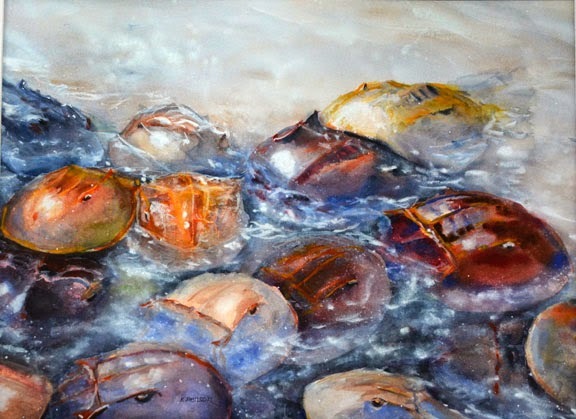 Kathie Benson's one-woman show at the Merritt Island National Wildlife Information Center will continue to May 31st. She has added "Full Moon in the Lagoon", the painting which won first in watercolors as the Titusville Art League's 50th Anniversary show this year. Visitor Information Center This is a great place to start your visit and find answers to your questions. Exhibits, movies, programs, water, restrooms, book store, and trails are available. for directions and activities. There are programs on Manatees on Wednesdays, Alligators on Thursdays, Florida Panther on Fridays and a nature tour by bus on Saturdays. Call 321-861-2352 for information and reservations.